1. 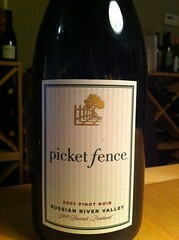 2007 Picket Fence Pinot Noir ($10) – With Thankgiving days away and the knowledge that this one is (or was) available from coast to coast it was a natural fit for my top choice. A very nice example of what much more expensive Pinot’s deliver. This one usually retails for $30. If you can’t find this one grab the Sebastopol Hills (my take on the ‘08) instead. 2. 2008 Steelhead Sauvignon Blanc ($6) – A very nice California styled Sauvignon Blanc this one would again make a fine fit on your holiday tables. Plush, full and balanced with cantaloupe and citrus on top of a firm mineral backbone which keeps the palate crisp and refreshing. If you can’t find this try the Overlake Sauvignon Blanc. 4. 2008 Trader Joe’s Pinot Noir Reserve Carneros ($10) – Yet to review this one but we have another winner here. Lighter bodied (and possibly more elegant) than the Picket Fence this one is smooth and juicy with nice fruit and acidity on a dry, orange rind finish. Trader Joe’s is swimming in great Pinot offerings for less than $10. Another alternative is the Caretaker Pinot Noir. 6. 2009 King Shag Marlborough Sauvignon Blanc ($7) – Another lacking a review (my thoughts on the’07) but it wasn’t lacking from my summer rotation as this o was once again a go to offering. Being much grassier, this is for those that are a fan of the Kiwi style (like me!). If you prefer to stay domestic the Geyser Peak is quite refreshing as well. 8. 2009 Emergence White ($7) – If you are interested in learning about new grapes you can experience Grenache Blanc, Marsanne, Viognier and Roussanne in this bottling. Full bodied and viscous on the palate with peaches and cantaloupe flavors before a mineral acidity kicks into balance this one out. For those looking for something off the beaten path try this with one of your holiday meals. 9. I’m going to do a little cheating here and give a nod to a few of my long time favorites; the Perrin Reserve ($7) and J. Vidal-Fleury ($7) from the Cotes du Rhone and the Casillero del Diablo Carmenere($8). Classics as I call them. I’ve enjoyed these vintage after vintage and always look forward to my next bottle. I LOVE the La Granja Tempranillo! I honestly have never had a bottle of wine at that price point ($4- are you kidding??) that I've really liked, let alone love. This one is in constant rotation at my house! I would just like to add (for our kosher TJs fans) that Trader Joe's has its own brands of kosher wines as well. They are notable in that they are the best values in kosher wine on the market. Nobody else comes close to these brands in terms of quality and price. They are Terrenal, Sara Bee and Banero. Most popular topics you choose. I like your thought. I would like to thank for your great creation.